This section of the web site attempts to put together my experiences and solutions so that anybody with similar problems can use them. They were written for Flight Simulator 2004 installed on Windows XP with SP3. You shouldn't be using XP any more - because Microsoft has so decided. I'm on Windows 7 now and whilst the issues are basically the same, Windows 7 is unfortunately not as forthcoming in identifying faults. If you have not downloaded and installed the v9.1 upgrade, you should do so. Please note that I do not offer a person-to-person support service. From time to time I may assist people that ask for help through the various forums for Flight Simulator, and I may refer them here. This information is provided for you to use "as is". Always back up your data before attempting any modifications so that you can revert to your original data if you need to. Every process described here can be reversed if it does not solve your problem, or makes things worse, as long as you proceed carefully and sensibly. Don't rush or cut corners. Some people that ask on forums expect and instant solutions. Sadly, this is rarely possible. With so many possible add-ons and permutations of settings, the possibilities are endless. Only the person with the problem can solve the problem and this may take many hours of painstaking tests. You have to be patient and prepared to put the effort in if you want to trace the problem. The clues below may reduce the time you will need to spend, but they will not do the job for you! The alternative is, of course, to delete your Flight Simulator installation and install again from scratch, and then reinstall your add-ons. That may or may not solve the problem, of course. But I have never had to resort to this, and with well over 1000 scenery layers and uncountable AI aircraft on my system I do not want to! It really isn't necessary with a carefully managed setup. A quick word about copyright etc. Please do not copy the content from here and post it elsewhere. Just link to this page. I regularly update it so the current information is always here. 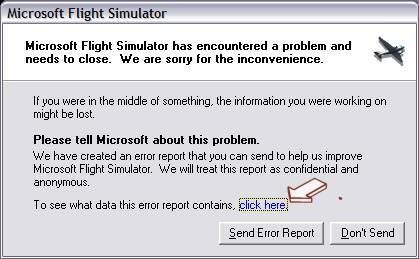 Most problems that people ask for are Flight Simulator software crashes. Some people call these Crash To Desktop or CTD, but this is not a good choice of phrase as it is ambiguous. There are two ways the software can "crash" or close down unexpectedly. When you get this message - do not just dismiss it as worthless - there is a link for more information on the cause of the problem which is valuable. However, the technical information will be of no use to you (unless you are a software engineer) and there is no point in reporting the issue to Microsoft as a) the problem is unlikely to be caused by their software, but by an add-on, and b) they will not be releasing any further updates to the software. The first window will look something like this. Click on the Click here link for more information. This will bring up a second window identifying the cause. In this instance it is g3d.dll. This gives a valuable clue as to the cause of your problems. Below you will find each potential failure listed with known causes and fixes. Sometimes Flight Simulator "hangs" when you attempt to start a flight at certain airports. This is usually caused by faulty scenery, usually at the airport concerned but sometimes at an airport many miles away! As an example I found I could not start a flight at any airport in the southern half of Africa. By elimination I found this was caused by a scenery of KMAF Midland, in the USA! That scenery included a lot of "exclude" files and I found that by eliminating most of these, the problem was solved. The curious thing is that the scenery itself seemed to work just fine without these files. These are usually caused by the presence of multiple AFD files with different airport co-ordinates. The crash will often occur when some distance from the airport concerned, when FS attempts to place the aircraft. It is thus sometimes difficult to identify the culprit airport. Multiple AFD files with differing co-ordinates will cause Flight Simulator to become confused, thinking they are separate airports. SOLUTION: Use a programme like AFCAD2 or AFX to search for AFD files for that airport and delete unwanted duplicates. I have never experienced this, but it may be caused by a corrupt voice file as some say it can be fixed by extracting a replacement usenglishbig.gvp or usenglishsmall.gvp file from the installation discs. If you use Radar Contact or other alternative ATC software you may find the advice at in the AVSIM Forums useful. Also, this forum discussion may be of useful. Failures attributed to fe.dll are usually caused by bad textures - probably on AI aircraft or possibly in add-on scenery. It can also occur with your own aircraft when viewed from outside, especially if panning around. If caused by an AI aircraft it can be tedious to trace. This relates to two-dimensional graphics - usually the panel. 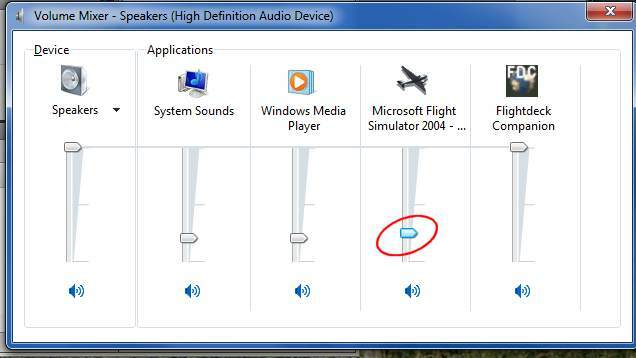 If you cannot load or reload a flight, change your Windows or Flight Simulator screen resolution settings. You can change back later. In your BIOS settings, disable video caching and shadowing. Disable fast writes on your video card found under settings. To access your BIOS, you usually need to press the Esc or F2 key during boot-up. In the discussion at http://forum.avsim.net/topic/363075-a-story-about-fs9-ctd/ it is suggested that this error can also indicate faulty AI aircraft textures (as fe.dll) above. A g3d.dll failure theoretically refers to three-dimensional views, probably scenery, although I have never encountered specific faults of this sort. Sometimes it is impossible to start at a particular airport - with this error. It seems this is Flight Simulator getting in a knot, rather than a physical problem. It can be resolved by going to another airport, and then loading the desired airport. 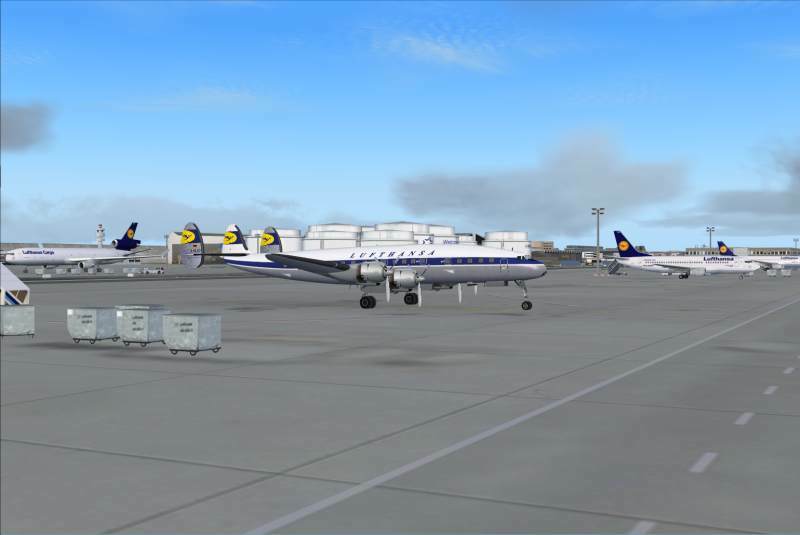 At http://forum.avsim.net/topic/351427-g3ddll-issues/ it is suggested that this failure can occur when using Airport Enhancement Services (AES) software and flying between an equipped and non-equipped airport. 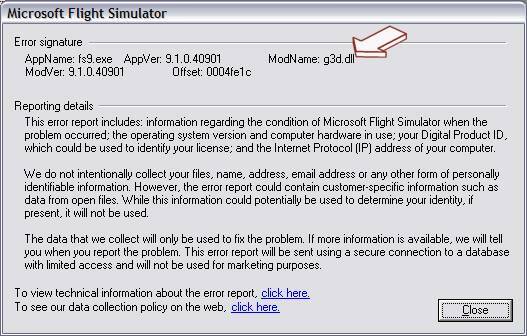 This one is rather intriguing, because ntdll.dll is not a Flight Simulator file but one belonging to Windows itself. It seems to crop up for a number of reasons. It can happen when loading an aircraft with reflective textures. You must have either RENDER TO TEXTURE in Settings > Display > Hardware turned on, or REFLECTIONS in Settings > Display > Aircraft turned on. Without one of these, this problem will recur with specific aircraft. I encountered an unfixable issue of this sort with a specific aircraft livery - there must have been a problem with the texture itself. This problem can also occur with AI aircraft with reflections, when the aircraft loads in Flight Simulator some distance before you are likely to see it. AI aircraft with reflections are generally not a good thing, as they a resource-hungry. "Render to texture" is hardware-generated reflections for DirectX graphics. Software crashes credited to ntdll.dll may also relate to multiple A&FD files with differing co-ordinates - see ai_playr.dll comments. I also encountered this error once with an incompletely created A&FD file - it was configured for AI traffic parking but the only runway was closed. Worth checking . . .
Aside of the above, it is entirely possible that the problem is actually not directly related to Flight Simulator. It may be an interaction between ntdll.dll and other drivers which need updating. If it proves impossible to start Flight Simulator and it credits the problem to panels.dll, Flight Simulator has got itself in a knot with your screen resolution. Back up and delete the FS9.cfg file - this will cause Flight Simulator to create a new FS9.cfg file with default settings and allow the software to load. The close Flight Simulator and reinstate the original file - Flight Simulator should now run with your original settings. A panels.dll failure during flight may be caused by add-on cloud textures. Reload the textures in DXT3 format rather than 32-bit or reinstate the original Flight Simulator clouds. This failure relates to AI aircraft and, possibly, other user aircraft when in multiplayer mode. It can be a tedious job identifying the offending aircraft. Tip - in the only instance I experienced this, the cause was an AI Mi14 helicopter of the Ukraine Navy which it seems is likely to have been converted from a flyable aircraft. If you cannot load a flight and indications are that symmap.dll caused the failure, the chances are that something has changed in the area of your default flight. Back up and delete your default flight (usually in C:\My Documents\Flight Simulator Files) and let Flight Simulator load its default settings. Then you can re-create and re-save a personal default flight. It will not come as a surprise that these are caused by faulty add-on terrain mesh files. I do not know how/what makes the files faulty but identification and elimination will resolve the fault. One that I identified that caused this problem on my system was Philippines-phil_mesh_v21.bgl. I also found a large number of FS Terrain files caused this problem, I removed all USA files (the default terrain for the USA is of reasonably good quality, anyway) and Alaska059.bgl. It is surprising that a payware product gave so much trouble, maybe it was later updated or perhaps it is dependent on hardware configuration. It seems it can also be caused by an unintentional duplicate installation with two identical mesh files. I have also experienced some strange results from poorly compiled mesh files - I had a huge, square, 13,000 foot plateau in Tunisia and a deep rift across Colombia. Each was caused by separate free add-on meshes in the Far East! Failures attributed to user32.dll are usually caused by a gauge which requires a registered version of FSUIPC.dll. FSUIPC is a third-party product which is usually arranged to work with any gauges that interact with it, but the onus for this is with the developer. One that I have encountered is RKG_speed.gau. Unless you wish to pay for the registered version you have no choice but to eliminate the offending gauge from the aircraft's panel.cfg file. This was traced by one FS user to the Reality XP WX500 gauge - solution was to remove the gauge. A search on Google suggests others have experienced system crashes caused by this gauge. If Flight Simulator abruptly closes with a "C++ Runtime Error R6025" message, this is almost certainly caused by the use of old aircraft models as AI. Responding "Yes" removes the undercarriage altogether. Responding "No" leaves it visible but recent extensive testing suggests that the actual lowering the gear is the cause of the R6025 error on some (but not necessarily all) FS98 models. This leaves a bit of a conundrum - the best solution is obviously to remove the aircraft from your setup altogether but that isn't always convenient. One possibility, if the aircraft is usually only viewed distantly, is to change the gear settings to be fixed undercarriage. Aircraft for which you have clicked on "Yes" in the above message are recorded in the FS9.cfg file in the [FrameCallNoWarn] section as "=1". Deletion of the entry will cause the warning message to re-appear, allowing you to re-choose your response. Your computer has run out of available memory. Flight simulator will now exit. You may not have enough free space on your hard disk drive. Run disk cleanup to free up space, and then try running Flight Simulator again. This is often called an "OOM Error". The message can cause some surprise and confusion - you may have plenty of memory and disc space. It might be referring to disc space used for Virtual Memory, this may not be the drive your Flight Simulator is installed on. And Flight Simulator 2004, being old software, does not use more than 1 MB of memory. Rebuild Windows Paging File. It may be corrupt. There is one other solution not listed by Microsoft because it involves unofficial modification of a core Flight Simulator file to allow it to use more of your computer's memory. You should explore all the above options first, although it seems few people do. SOLUTION: There are two solutions - applying a patch to the FS9.EXE file and modifying your Windows boot-up procedure to make more memory available. Modifying FS9.EXE: A tool called the 4GB Patch which will modify the base file of any game that gives this problem is available from http://ntcore.com/ (although I'm told it isn't possible for it to access more than 3GB of memory). I have never experienced any such errors since applying this modification. You may have to re-register some add-on software with complex copy-protection arrangements that works through the fs9.exe file which gets modified with this patch. As far as I know all vendors have arrangements for this - check their forums. Modifying the boot-up arrangements: A detailed page of changes to implement what is known as the 3GB switch can be found at http://forums.flightsim.com/fswiki/index.php/OOM_Error . A 64-bit Windows XP installation probably does not need or benefit from the changes. The jury is out on the effectiveness of these solutions but the truth is that many say it has completely eliminated these frustrating error messages that destroy a flight shortly before completion. Some self-claimed computer experts say it cannot possibly work, others say it needs both the 4GB patch and the 3GB switch to work. The truth is that on both my old and new computer, the 4GB patch has proved the perfect solution on its own, and application of the 3GB switch alongside it caused a lot of pausing and disk-thrashing during use of Flight Simulator in both cases. I recommend using the 4GB patch alone to start with, and see how things go. The patch will make a backup of the original file, so you can easily revert. You can also use the no-CD patch with this. If you still have this problem at specific airports, you probably have some Landclass files in the wrong place. Check the scenery is installed as per the instructions - although in some cases the designers have wrongly supplied Landclass files in the airport's scenery directory (e.g. Istanbul Sabiha Gokhen). In some cases you have to spend a lot of time tracing and eliminating files to find the one (or more) causing problems. There is only one way to do this, there are no short cuts and nobody can do this for you. You just have to grit your teeth for a long, systematic and tedious series of tests. First, you must be able to identify a situation where the problem repeatedly occurs, and save the situation so that you can keep loading that situation to check if things are fixed. It is a good idea to use autosave.dll by Pete Dowson if you experience problems, which will automatically save your flight at pre-determined intervals. It is a natty utility to have, anyway. If you believe the problem is caused by scenery, temporarily disable all of your add-on sceneries in the Scenery Library. If you believe the problem is caused by AI aircraft, temporarily remove all AI aircraft files to a place outside Flight Simulator. If this seems to resolve the problem, restore 50% of the sceneries or aircraft. Test again. Did that fix it? If so reinstate 50% of the remaining ones. If not, remove 50% of those that you reinstated. Carry on in the same fashion, each time reducing the quantity by 50% until you gradually pin the cause down to one scenery or aircraft. You can even remove specific textures or scenery .bgl files by the same process, to identify the actual file causing the error but in most cases you will probably want to dispose of the add-on aircraft or scenery altogether. Occasionally, you may discover that FS sounds go so quiet that even with settings at 100% it seems very distant. This is particularly awkward when using third party ATC products and the like, which have a separate sound source. Turn the volume up to hear FS and the add-on becomes deafening. This may be caused by a number of things, but my own experience was through clicking (unintentionally) on a cockpit CD player. Aircraft and ATC sounds went suddenly quiet. Creepy! You may find that the Flight Simulator level shows the (apparent) default of 25% but move the slider up to about 75% or even 100% to get your sound as it was. Important - you must have the appropriate software running for it to be visible in the Volume Mixer. If FS isn't running you will not be able to see or adjust the levels. Rule No1 - regularly take a good backup of your FS setup. With a bit of luck you will never need to make a full restoration but it is often useful to have it there to restore files from that have been altered for one reason or another. Rule No2 - avoid installing from auto-installers if possible. Whilst they may appear to make your life easier, they can do quite the opposite. You do not know what is being installed on your system (inside or outside Flight Simulator) - would you let a complete stranger loose on your computer? I know of three instances where an auto-installer has maliciously included a virus or trojan file, and have also come across several seemingly genuine files which have a distinctly adverse affect on your setup, whether this is deliberate I could not say. Quite a few will happily over-write your default files without warning to make their one scenery look more realistic but stuffing up many other airports around the world. Most auto-installers give you a choice to install the files outside Flight Simulator but occasionally they ignore the destination directory you choose and still install direct to Flight Simulator, using the route given in the Registry. But you can play that game too - temporarily rename your Flight Simulator 9 folder something else, e.g. Flight Simulator 9 disabled . Then you can see what files it will install and decide whether to use the auto-installer or transfer your files manually. With so many lovely freebies to download and install, you really need to be careful. Rule No3 - don't use Windows' System Restore if you have a problem. It is not what Windows Restrore is intended for and it will often cause more problems than it solves. It is there to be used as a last resort to restore Windows rather than individual software. There is a limit of 200 aircraft in any one aircraft folder, and any in excess of that will not function as AI traffic. You should disable your anti-virus software before installing add-ons to Flight Simulator. Unwise advice! Empty texture directories (particularly those associated with landclass files) will cause slow frame rates or an Out of Memory software crash. See http://forums1.avsim.net/index.php?showtopic=235923&hl=martinlest2 for an explanation of exactly what does and does not cause problems. Disc defragmentation will make a significant improvement to the speed Flight Simulator runs at. (A February 2011 PC Pro magazine article confirms this is dark ages stuff, a modern disc can access any give data block in less than 1/100th of a second, so a file would need to be fragmented into a 100 pieces to cause a second's delay). Registry error checking software will identify entries that will degrade performance - unlikely as (according to PC Pro magazine February 2011) most simply identify entries relevant to removed software. So how do you know anything I write here isn't rubbish? You don't! But if you follow my advice and take backups you can't wreck anything permanently.